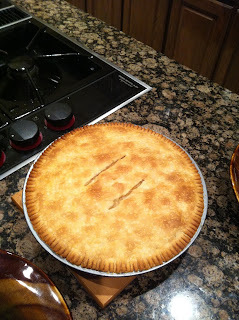 This delicious chicken pot pie is a big hit in my house, especially on cold winter nights. I hope you enjoy it as much as we do! Pre-heat oven to 425 degrees Fahrenheit. The pre-made refrigerated pie crust should come in two pieces, one for the bottom of the pie, and one for the top. Drape one of the crust pieces over a nine-inch pie pan and gently press into the pan, making sure the entire pan is covered. Use a paring knife to trim any crust that extends beyond the lip of the pan. Microwave cubed potato for 3 minutes on high, and set aside. In a large saucepan over medium heat, melt the butter. Add the onion, celery, carrot, and sauté until onions are translucent. Add the chicken and stir-fry until browned. Add the flour, continuing to stir-fry until all of the chicken and vegetables are well-coated and the flour is beginning to brown. Stir in the chicken broth a little at a time making sure all of the flour gets dissolved into the broth. Bring to a boil, then reduce the heat to simmer. Add the salt, pepper, potato, peas, and corn. Simmer for a few minutes to reduce the liquid. The mixture should be quite thick, and not soupy. Spoon the mixture into the pie. Do not over-fill. Drape the other half of the pie crust over the pie. Using a dinner fork, press the tines into the edge of the pie, going all around the pan until the top crust is sealed to the bottom crust. Using your paring knife, trim off any crust that extends beyond the lip of the pan. Cut a couple of slits into the top of the pie. Bake for about 40 minutes, or until crust is golden brown. About halfway through baking, you can cover the crust edge with foil to keep it from over-browning. Let the pie rest for about 5 minutes before serving. Note: If you have extra material after filling the pie crust, don't despair! You can easily freeze it for later use in a delicious chowder. Just re-heat, and add chicken broth until you get the right consistency, then add chopped green onion just before serving.